The last thing anyone wants to feel during the summer is low confidence. But for many women, unwanted facial hair stops them feeling as good as they should about themselves. In order to deal with this condition effectively, it’s important to gain a greater understanding of unwanted facial hair and the treatments available. Why do women get unwanted facial hair? There are a few possible causes for unwanted facial hair in women, but the main factor which leads to the condition is a hormonal imbalance, often brought on by age. More specifically, many women find that unwanted facial hair starts to become a problem around the same time as they are going through the menopause. The menopause brings a significant shift in hormones which starts years before the menopause itself takes place, but accelerates when it does. As women age, their oestrogen levels decrease, while testosterone levels stay largely the same. This can sometimes lead to bodily changes that are more commonly associated with men, such as the production of facial hair. Unwanted facial hair in young women is often the result of conditions like PCOS, or Polycystic Ovary Syndrome, which affects around 20% of women and can result in hormone imbalances. What do women do to get rid of unwanted facial hair? 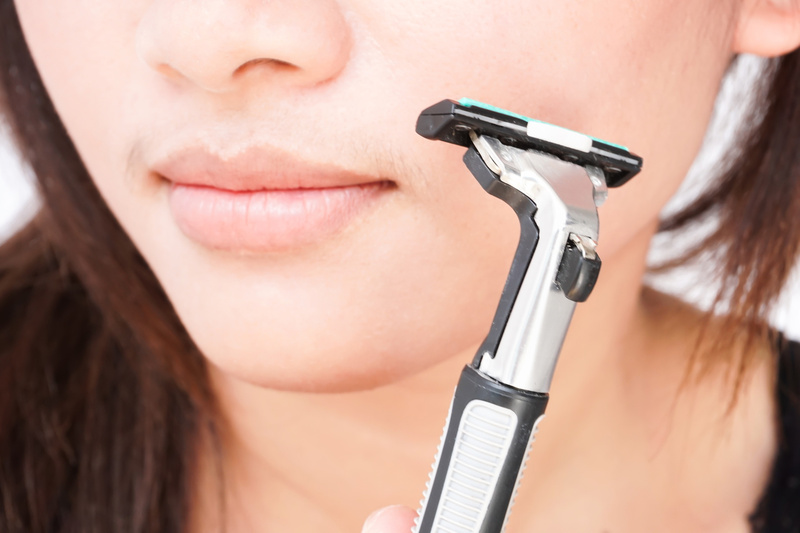 Unwanted facial hair most commonly occurs on the chin, cheeks and upper lip. Some women don’t find it to be an issue and are happy to leave it there, while others try a variety of methods to get rid of it effectively. Tweezing is one of the most common methods, but it is also one of the most painful. It can also be time consuming and can irritate the skin where the hair follicle was growing. Shaving is a safe and fast way to deal with facial hair, but it is less efficient as it must be repeated frequently. It also carries a stigma of appearing “unfeminine”. However, shaving does not, despite popular belief, make the hair thicker when it grows back in. Other methods include threading, waxing and laser hair removal. These produce longer lasting results, especially laser hair removal, but can become costly and time consuming as they require professional intervention. Laser hair removal involves zapping the hair follicle with heat, which destroys it. For many women, effective unwanted facial hair medication is the best course of action for dealing with their symptoms as thoroughly as possible. Vaniqa is an effective medication, designed for application to the skin. It has been shown to lead to effective hair removal on the face and adjacent areas under the chin, and results can be seen after as little as 4 to 8 weeks when used twice a day, at least 8 hours apart. Vaniqa works by slowing down the rate of growth of the facial hair. It alters the growth stage of the hair cycle by interfering with an enzyme in the follicle which is necessary for the hair to grow. Vaniqa is available from Express Pharmacy. In independent customer reviews, the unwanted facial hair medication is rated 10/10. If you have any queries regarding your health concerns, contact our team today. You can call us on 0208 123 07 03 or use our discreet online Live Chat service.